There are many important differences between Eastern and Western dragons. hether you live in Cambodia or Scotland, Lithuania or America, you have probably heard of dragons. The eastern dragon, sometimes called Lung (in China) or Long (in Vietnam), may almost seem like a completely different creature than the Western Dragon. Their anatomy, their behavior, their symbolism, and what they mean to society are quite different. The East seems to value dragons for their magic and beauty. They were held with high respect from the people in the East. However, this view is drastically changed in the West, where dragons were viewed as monsters. Dragons from the East are used in ceremonies and parades. This creature, like the Western dragon, can sometimes also take on the form of a monster. However, it is made of many different animal qualities and parts. It symbolizes heroism and not so much danger or threat. The Eastern dragon is seen as more of protector than a villain. It is a symbol of beauty and power. The Chinese even have a year of the dragon, and it is said that anyone born in this year will be healthy, wealthy, and wise, all of the things which the dragon of the East represents. The year of the dragon is also said to be a very prosperous year for the people of China. 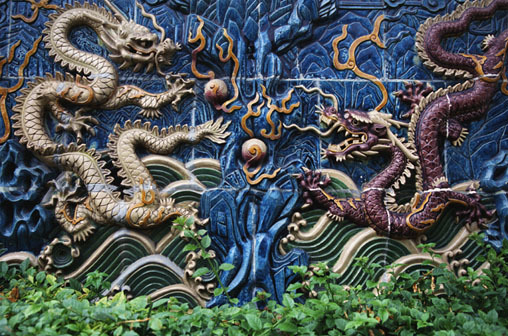 Because the Chinese hold dragons in such great respect, there are many tales about dragons and the wealth that they bring to the people of China. One story is about a dragon's pearl. Many stories involve dragons protecting riches. But this story is about a single pearl. It is said that a poor boy found a dragon's pearl that multiplied everything that it touched. When they put it in their rice dish one night, the next morning it was full of rice. But when a robber came to still this pearl, the young boy quickly swallowed it. The story goes that the boy then turned into a dragon himself. While this Eastern story is about the good of turning into a magical dragon, the West has a story of punishment that leaves a man a dragon. In this story a prince kills his father for his fame and fortune. Because of this the dying king puts a curse on his son that he will become a dragon. Later in life this dragon is killed by another of his greedy brothers, who then receives the curse and becomes a dragon as well. Very little seems to be the same between the dragons of the East and dragons of the West. Even the dragon's habitat changes between the two cultures. Eastern dragons almost all live in some sort of damp place, more likely a lake or the ocean. The Western dragons are the one who are said to be able to live in the deserts or even in fire. 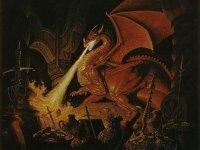 Dragons from the West are said to breathe fire and are seen as unwanted and something that a hero must work to get rid of. These dragons try to kill people who get near them by breathing out fire. They also have great wings and sharp claws. In almost every thing we read about dragons, the author has had to decide which type of dragon to focus on, the Eastern or the Western. This usually depends on where the author is from and so the type of dragon that he or she is most accustomed to. When talking about dragons it can almost be impossible to talk about a dragon without being biased to one culture or the other. 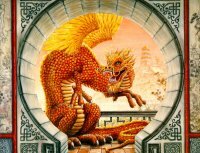 It could be that the reason each dragon is different between cultures is because the people had never actually seen one, only heard stories and descriptions of them.